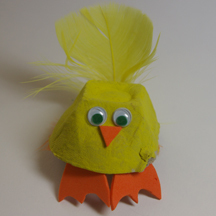 Kids can make a chick or a duck (I think my example is a hybrid) using a section of an egg carton and other random craft supplies. It’s great for Easter, and you can recycle those old cartons! What You Need: Cardboard egg carton, scissors (strong ones for adult to cut apart carton), safety scissors, craft foam, googly eyes, feathers, paint, paint brush, glue, tape. How to Make It: Paint egg carton and let dry. Then let kids go wild cutting out and attaching features. They could make a bunny, too! Save the plastic capsules from those gumball machine toys. They’re great for crafts such as these cute toy capsules. You can fill them with candy or just stuff them with cotton or crumpled tissue paper. How to Make It: Stick cotton or candy (but not cotton candy) inside capsule and secure lid. Kids can then creatively decorate them using supplies you set out. Glue takes awhile to set on slick plastic; I used sticky glue dots instead. These little bunnies are so cute, and a great way to preserve the memory of a child’s little hand. My son was only 2 years old when I launched FreePreschoolCrafts.com and used him as my model. Now he’s 8 years old, and here’s his hand as a bunny! What You Need: Pink construction paper, white acrylic or other non-toxic paint, paintbrush, googly eyes, pom pom, glue, scissors, marker. How to Make It: Paint child’s hand and have him or her press it against the paper with fingers spread apart as shown. Let dry. 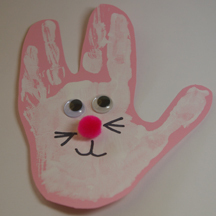 Cut out around hand and fingers so that fingers look like bunny years. Glue on eyes and nose and draw whiskers and mouth. 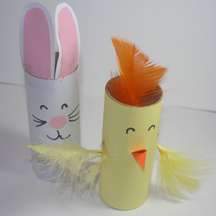 Save up those TP rolls and let kids use random craft supplies and their imagination to make bunny and chick decorations for Easter. For a fun variation, paper over the bottom and the roll can hold candy or other treats. What You Need: Toilet paper rolls, feathers, construction paper, felt, markers, pom poms, glue, scissors, tape, and anything else fun that you have on hand. Kids could also paint their rolls rather than cover them in construction paper. How to Make It: Pre-cut strips of construction paper to the length of toilet paper rolls. Secure one end of paper to cardboard, roll around and secure the other end with tape. 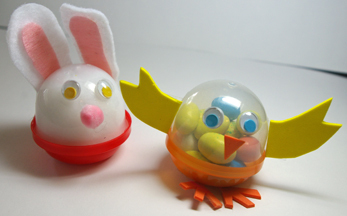 Glue or tape on feathers, felt or paper ears, pom pom noses, construction paper beaks, and other cute features. Use googly eyes or draw on eyes and whiskers. 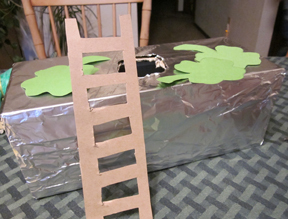 Little kids love trying to “trap” a leprechaun on St. Patrick’s Day. Let them embrace their imagination by setting out supplies for a creative trap-building project. What You Need: Shoebox, foil, construction paper, scissors, tape, and any other supplies you have on hand. Green glitter and shamrock stickers would be especially fun. You’ll also need a stick of some sort to prop the trap open to catch the leprechaun, if the child wants that style of trap.